Earlier this year actress Jessie Cave (Lavender Brown) launched her own website, Pindippy.com, where she updated various projects she has and is working on. Included amongst them is a video series called Flat Whites, named after the coffee drink sworn by and drunk by a variety of characters in the clips. The series itself follows Jessie's character Rochelle, an "ex- installation artist," locally of Australia, and her rather extended family of cousins, aunts, and godparents, amongst many. A couple of new cousins were recently featured in newer sketches, notably Jessie's former Harry Potter costars Evanna Lynch (Luna Lovegood), Scarlett Byrne (Pansy Parkinson), and Georgina Leonidas (Katie Bell in the last three films). The over twenty clips follow Rochelle and her family through a variety of regular activities in their hometown, all the while praising and arguing over their beloved flat white drink. The clips of new cousins Geneva (Evanna) and Crystalline (Scarlett), can be seen below. Please note: there is very strong language in the clips, so do heed with caution. Love the tie-dye and headband! It's like a blast from the past! They're all so cute :3 Fun to see them play different roles... especially Evanna! Oh crazy Cousin Rochelle and her flat whites! I do get a huge giggle from watching the series. haha. Love the tie dye. Ahh, these made my day! Last edited by Ringo; 08-24-2011 at 03:54 AM. I love Evanna's hair and the videos were pretty cool. Didn't really know what was going on though. Nice to see them all together. It makes me feel the HP environment once again. I love Jessie Cave and her Pindippy website and vids. She's so creative! Nice episode with Evy Lynch. Her voice is so... soft! 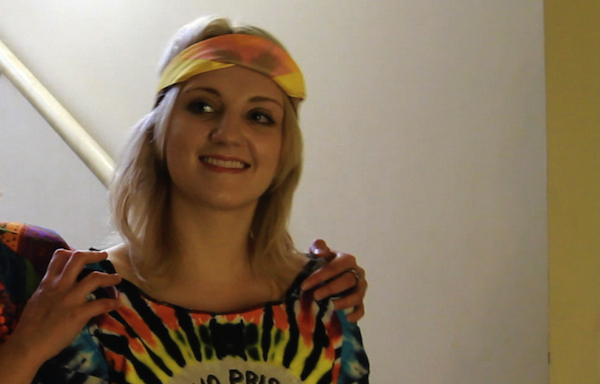 Evanna looks so cute !! See ? An early reunion ..